Your little one isn't asking you to check under his bed, behind his dresser and inside his closet to find monsters because he wants to find them all on his own. He's not scared of anything, not even monsters, in fact, he's fascinated by them. He only hopes to open his eyes and find a big, fluffy colorful monster standing beside his bed. What can you say? He's a unique little treasure of a child! Since he's such a monster-fanatic, he loves Halloween. In fact, he's decided on his Halloween costume in early August! The monster ankle socks are perfect for both monster and Halloween lovers and especially those who love both. Gift them to your child as a way to amp up their excitement for the upcoming holiday or to wear while they're looking through their favorite picture book featuring what else but colorful pictures of monsters! Pass them out for a trick or treat surpirse or give them to your child early so they have the perfect pair of socks for Halloween. These socks are made from a blend of spandex so they're comfortable and can easily stretch around feet and they're decorated with cute monsters, pumpkins and eyeballs. 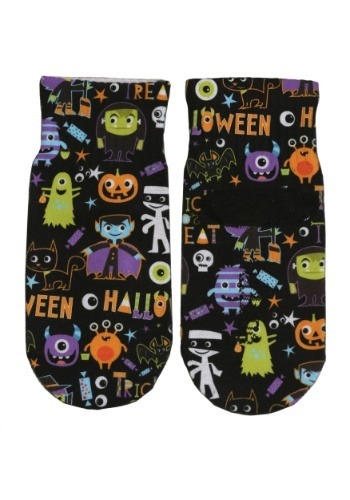 Don't forget to check out all of our kid's Halloween socks!